Check it out, you'll love it! For those in search of the ultimate chic summer residence with a specific atmosphere, just 40 mins drive north of Copenhagen. Two exclusively decorated houses with a touch of romance, with all necessary facilities and comfort. A 100 yard walk through a little pine forest takes you down to huge stretches of great uncrowded white sanded beaches, and Hornbaek village is just a mile down the coast road. There are several cultural activities in the summer period, and the historic Hamlet's Castle KRONBORG, is barely 25 min. drive away. If you're into golf there are two 18 hole links both 15 min. drive from town. The towns harbor caters professionally for leisure sailors. Coastal fishing is possible at all times and a cutter from Helsingoer has organised fishing tours on the sound. If you're into hiking, you'll be wondering all over the coastal area. There are umpteen places to discover.. N.B. This house is NOT for Jacuzzi enthusiasts . Prices are based on 4 pers. Suppl. guests cost Euro 25,- per night.... Bienvenue! 'Born and bred' in Copenhagen, Denmark and still residing there! A passionate interior designer as you will discover from the manner the house has been furnished and decorated. You're a stone's throw away from a great uncrowded white sandy beach and Hornbaek village is just down the road and offers ample shopping facilities. There are several good restaurants proud to introduce you to an experience in Danish gastronomy! The house has been totally rebuilt in 2015 and 2016 following fire damages. All the desired modern amenities are available. The garden surrounding the house is large enough for ball games and you won't have any concerns about the traffic. You came here to relax and have it all around you with no hassles. Now go for it and enjoy your stay.....FULLY! A well positioned, well thought out and conceived summerhouse, near the beach and the village with parking facilities for three cars. Modern bathroom with all facilities. Wireless access to the WIFI internet. There is a family size fridge and freezer. The kitchen elements contain all necessary modern appliances and equipment. Glass covered veranda for outside dining. No access for wheel-chairs at present. If requested, we will make the necessary arrangements and alterations in order that a wheel chair can enter without difficulty. There are door steps though. Extremely nice and super equipped house at the sea. The hosts are super pleasant and always ensured we feel good that their home. Highly recommended! This home is perfection! Jette and Jean have the most exquisite taste and everything is well thought out and well equiped. There are two homes of the property and they are each very private. We rented the larger Captain house (3 bedrooms). The garden is beautiful. Cherries in the tree and strawberries and the most beautiful flowers. The bedrooms are small but in keeping with the style of the home - and the house, garden and deck are so beautiful that you really only sleep in the bedrooms. The beds are very comfortable. Amazing shower! Very close to town and across the street to the beach. The small train (the piglet) runs behind the house and we found it charming. The owners are lovely and so kind and helpful. We hope we can return to this magical place! Thank you Jette and Jean (and Oscar!). Great family from all ‘branches’. Flattered that they chose our summer residence to spend their holiday in Hornbaek. Lovely that they appreciated the house so much as we make an effort to keep everything in order and in good taste. They are more than welcome to visit us again in the future. Description and reality are totally consistent. Jean is a great and helpful landlord. The building is more than fully equipped and we felt at home every second of our nine day stay. Every one of us (couple and two grown up kids) found his or her favourite place to be - inside the house or in the beautiful garden. We were lucky with the weather and only had a few days with rain showers, but even on rainy days you feel comfortable in the house with it's beautiful furniture and decoration. The windows in the roof are a real highlight! In our view this was very good value for money! From my first encounter with Frank Schaich and his family there was no doubt that this family were the ideal guests. They were positive and appreciative in noticing the efforts we have put in decorating the premises and to certify that the guests are really in their right element. The weather is a force majeure which can’t be altered and so is this family. Great people. May our paths cross one another again. A surprise beyond all expectations! We came, we saw and we were rolled over!!!! Check it out, you'll love it! 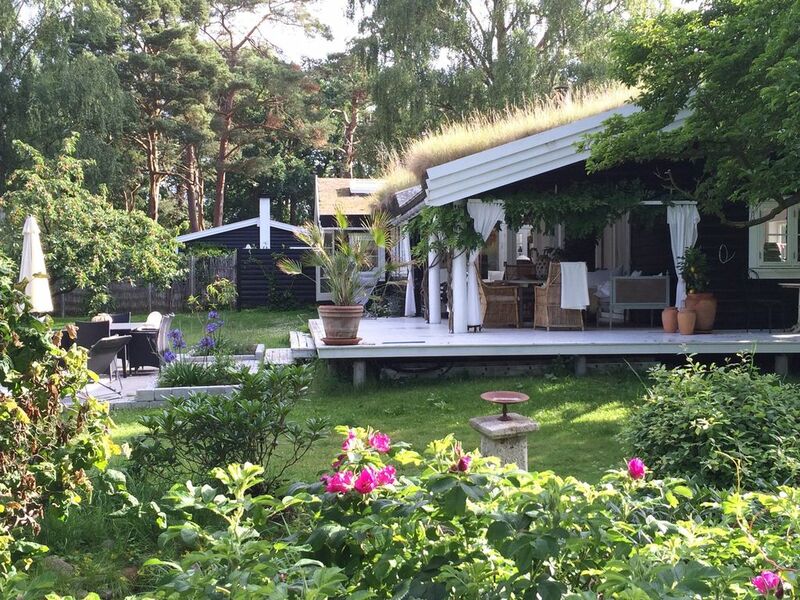 For those in search of a summer residence with a particular atmosphere, just 45 mins drive north of Copenhagen! A house decorated with a slight touch of romance, with necessary facilities and the comfort. A 200 yard walk through a little forest takes you down to huge stretches of great uncroweded beaches and Hornbæk village is just a mile down the coast road. There are several cultural activities in the summer period, and Hamlets Castle KRONBORG, is barely 25 min. drive away. 2 great golf links, fishing and numerous hikes. Now for the house! From the entrance with a built in open wardrobe, you have access to two bathrooms and three bedrooms. You then proceed to a spacious and tastefully furnished sitting room with overhead roof lighting and a fire place. It opens out onto the dining and open kitchen area. The glas roofed south-west terrace looks out onto a fair size picturesque garden with a fishless pond. The property is located near the little local railway line and the coast road. Public transport is frequent at all times of the day and the enclosed parking area can accommodate 3 cars. N.B. This house is NOT for jacuzzi enthusiasts.... Bienvenue!